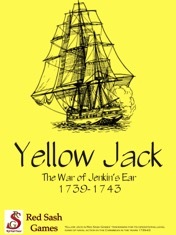 Yellow Jack (YJ) is the third of a set of games covering the Age of Sail at an Operational level, suitable for two players. Autumn, 1739. Fierce economic competition between Britain and Spain has broken into open war: the War of Jenkins' Ear. As His Britannic Majesty's naval commander-in-chief in the Caribbean, your duties have suddenly multiplied. Their Lordships at the Admiralty demand action. Parliament expects the speedy conquest of Spain's New World possessions - ALL of them - but is unwilling to supply men and ships. That would require the adoption of methods suitable only under a 'French Despotism'. Before you utter them let it be known that your objections are unpatriotic and un-British. Meanwhile, the powerful Planters' Lobby is insisting you make defending their islands your top priority, while the equally powerful Traders' Lobby is demanding convoy protection and simultaneously accusing you of 'pressing' merchant seamen into service aboard your ships. Or, can you honourably serve the great House of Bourbon, whose scions rule France and Spain? The English heretics have unjustly fabricated a war. They are jealous of Spain's greatness and desire her colonies for their own. For years they have paid lip service to the international laws of commerce while breaking those same laws at every opportunity. Of late, His Most Catholic Majesty had graciously agreed to accept arbitration for so-called 'wrongs' done to British traders, waiving compensation for similar wrongs done to Spain. But when she offered payment, the English dogs slapped Spain's hand aside, saying it was not enough! This insult will not go unavenged. The King has ordered you to secure our trade routes and has issued letters of marque for the harrying of British merchantmen - let their own methods be used against them! In the fulness of time, our brother France has promised his support. Control the seas and you control the fate of the New World. Whichever side you choose, glory and honour - and prizes galore - are yours for the taking. Provided you avoid court martial and disgrace. 1) Four map sections representing the whole of the Caribbean and the Gulf of Mexico. The map uses a point-to-point system of movement based upon the various prevailing winds. 2) 720 die cut counters plus (in the boxed version) about 35 wooden disks. 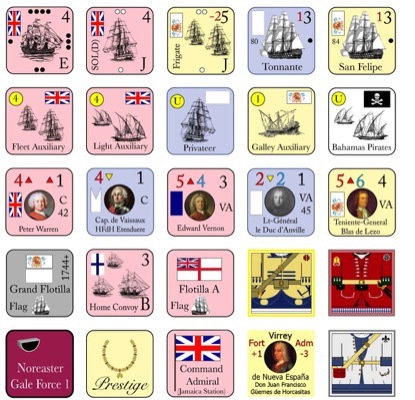 These represent the British and Bourbon squadrons, leaders, and auxiliary assets, plus the land forces used in the theatre.